The chicks are doing well. They look active and alert and are well fed and attended to by Rebecca and Kewpee. The three older chicks are now 4 days of age and the youngest is 2 days and is obviously smaller and less coordinated. People are sometimes concerned that the runt of the clutch gets less food and cannot compete with the older chicks. There are two video clips from 4/28/2018 that show how Rebecca does not forget about her littlest one. In the first clip, the three bigger chicks get a lot of food. They are taller and muscle their way closer to Mom. 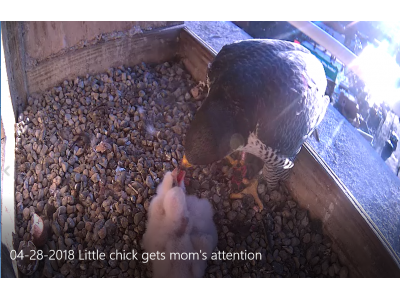 But, in the second clip, the bigger chicks have fallen into a food coma and the little guy gets all of Mom’s attention (and food). She knows what she is doing!